Some of the most beautiful wedding cake creations cost a fortune and I do mean a fortune. The quality of the ingredients, the sheer size and intricacy of detail and the addition of jewels and precious stones can make your dream cake impractical. These things often place these most extravagant cakes only on the tables of the very wealthy. Gaze at some of the world’s extravagant wedding cake designs. One of most expensive jeweled wedding cakes was unveiled in Beverly Hills at the Luxury Brands Bridal Show. This diamond-studded wedding cake was created by Mimi So Jewelers and cake designer Nahid La Patisserie Artistique. The cake is embellished with diamonds both exclusive and priceless. The cake wasn’t meant to be edible or even touched. The diamond-studded masterpiece was said to be worth $20 million when it was unveiled in 2006. Delicious Cakes and Dallas Gold and Silver Exchange collaborated to create this stunning and expensive nine tier confection. As another of the world’s most expensive wedding cakes, it was adorned with 1,200 carats of diamond and precious gemstone, at a cost of $1.3 million. 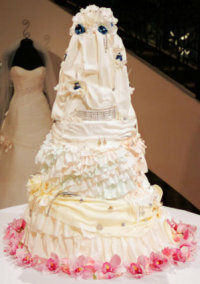 This fabulous jeweled cake was the star in the annual Dallas Bridal Show in 2010. This cake was designed to be edible (after the removal of the diamond and precious gemstone embellishments) but not touched. These luxurious yet costly confections were not meant for the faint of heart or for a bride on a budget. They were designed as novelty, fantasy cakes. Use these designs as inspiration to create your own extraordinary wedding cake to fit your budget. This entry was posted in Wedding Cakes, Wedding Planning and tagged Wedding Cakes, Wedding Planning. Bookmark the permalink.